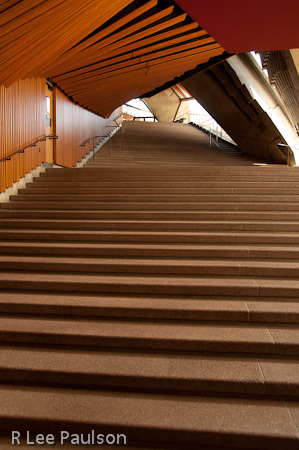 Inside the lobby of the concert hall, these steps leading up from lower hall seating to higher hall seating meet on the glass fronted level below me. It doesn't look like much during the daytime, especially from this perspective at the top of the stairs. But at night, everything changes. At night, standing in front of the wrap around windows, as the man in the opposite picture is, the entire harbor is lit up like a gigantic movie set and arrayed in panoramic detail in front of you. The effect is stunning. I keep using the word breathtaking. When we came out here during the intermission to Madam Butterfly and looked out those windows, well, let's just say that view alone had been worth the price of admission. 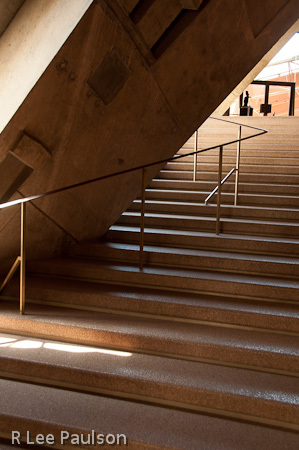 Here, more stairs lead up to balcony seating. This inside shot shows how all the ribs for each shell fan out from a single point. Here is an outside view of the ribs fanning out from a single point. Notice how the roof is covered with small tiles. 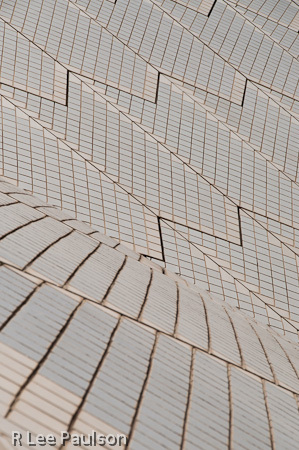 Notice also the deep grooves in the lines of tiles. 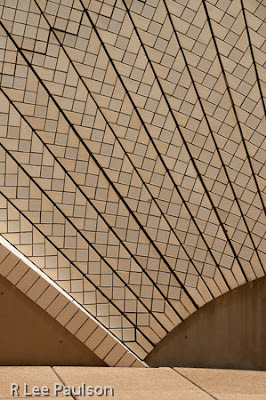 Utzon knew that normal rain gutters are unsightly and, since the building would be viewed and photographed from all angles, he had no place to hide them. 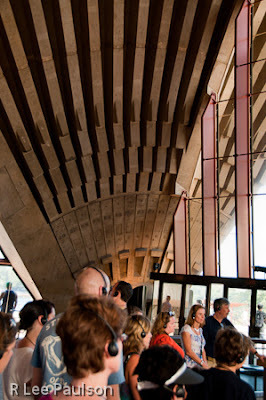 So he designed these grooves into the roof structure itself. Rain water is drawn off the roof through these grooves, and then led away into storm drains. It took Utzon three years working with a tile company to come with a rain tile that suited him. Notice that the tiles are all shades of off white. 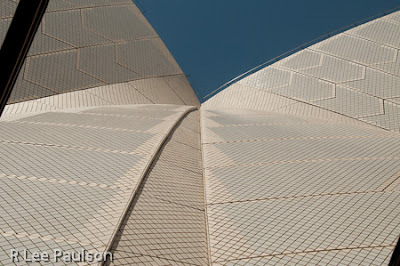 Utzon did that to keep folks from being blinded by pure white tiles when looking at the building in direct sunlight. 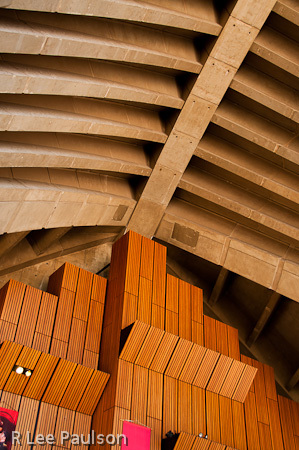 Utzon also knew that getting up to clean dirt off all the shells would be difficult. So he and the tile company came up with a finish for the tiles that basically has no surface tension. Thus, any dirt that might collect on the tiles is always washed away by the rain. That long term solution had horrific up front costs. I can't even imagine how much it must have cost to tile all those shells with those intricate patterns and tiny little tiles. Sure glad I wasn't up there working on it. Another view of how the different shades of tiles are used in the shell design. One can also better see how the deep grooves work the water down off the roofs to specific spots. Another inside stairway. 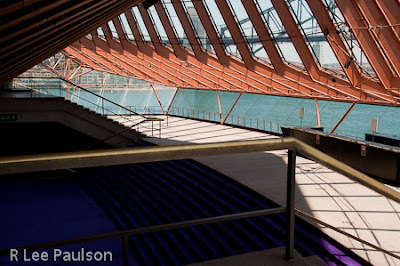 I loved how the structural aspects of this building became part of the interior design. Here's an inside shot of the roof ribs meeting in the center of a shell. Sadly, inside photographs of either the concert or opera halls were not allowed. We found out why when we finished our tour. They wanted to sell us photographs of those places. We found the $35 asking price a bit steep and declined. As we were leaving, a man stopped me and asked if I would take his picture in front of the Opera House. I did and he returned the favor. 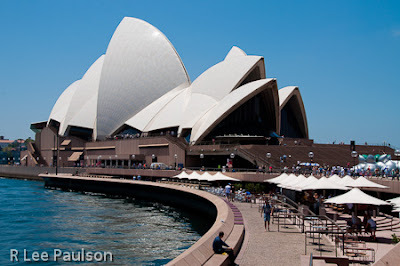 Here is a view of the Opera House taken near the ferry terminal. 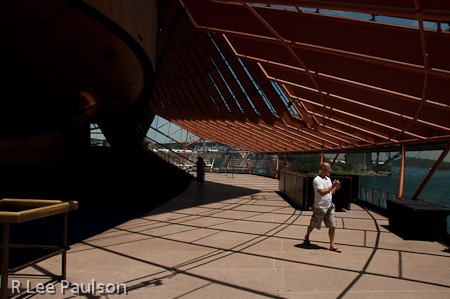 Sydney's Metro Train system has a terminal essentially right above the ferry terminal. This is the view folks have as they walk toward the Opera House after exiting the Metro station. 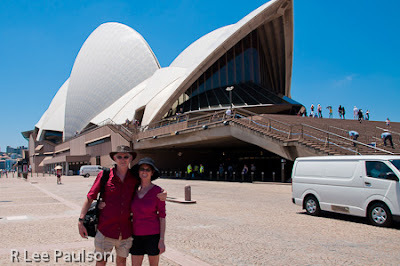 But we weren't walking toward the Opera House. We were walking away from it. The next morning, after enjoying the evening's performance of Madam Butterfly, we packed our bags and headed home from another fabulous time away. Click on a trip below for a pull down menu that will take you to any post for that adventure.